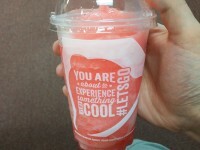 I tried the new Taco Bell Starburst Cherry Freeze yesterday when it first came out. In order to get the happy hour deal, I picked up a freeze after 2 PM and paid just $1.00, however, a regular sized freeze normally costs about $2.29. This freeze is very hard not to compare it to the Starburst Strawberry freeze that has been available now for almost a year. 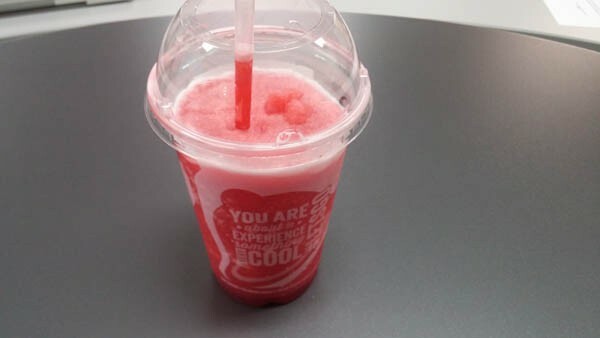 While the Strawberry freeze is very sweet, and tasted completely identical to strawberry Starburst candies, the Starburst Cherry Freeze is less so. The flavor itself is very close, however it seems like they have reduced the sweetness factor significantly. It is still sweet, but it tastes more like an ordinary cheery slush drink. While the strawberry flavor is distinct and unique, the cherry flavor can be achieved at any 7-Eleven or place that sells Icee drinks. 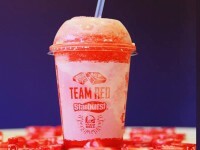 I can understand that Taco Bell would like to bring in somewhat of a variety of flavor (and not want something so close to the strawberry that they already have), but I think the move does miss the mark on what is possible. Overall, the drink is still delicious, and is definitely a great deal at $1.00. If you are turned off by the powerful sweetness of the strawberry flavor, the cherry might be perfect for you. It is, however, very ordinary when it comes to cherry slush drinks. 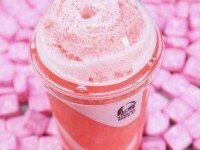 The Taco Bell Starburst Cherry Freeze is definitely sweeter than the Baja Blast freeze, but not near as sweet as the Strawberry Freeze. In my mind, it misses the mark on the true Starburst Cherry flavor and becomes an ordinary Strawberry flavored drink.